Easy-Bake Ultimate Oven Baking Star Edition Just $28.88! Down From $48! You are here: Home / Great Deals / Christmas Deals / Easy-Bake Ultimate Oven Baking Star Edition Just $28.88! Down From $48! Right now you can get this Easy-Bake Ultimate Oven Baking Star Edition for just $28.88 (Reg. $48) at Walmart! Please keep in mind that this item is available for FREE in-store pickup only! The new Easy-Bake Ultimate Oven Star Edition is a fresh, modern addition to any kitchen where kids love to bake. It lets kids feel like baking stars when they can make scrumptious treats for family and friends. This version of the Easy-Bake oven for kids is electric and no lightbulbs are needed. It also has an updated look in sleek white, with sparkly gold, pink, purple and periwinkle accents. Besides the oven itself, it includes a rectangular baking pan and a baking tool. 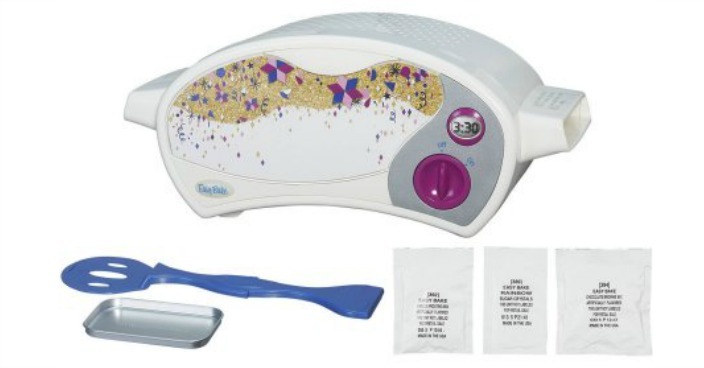 The Easy-Bake Ultimate Oven Star Edition also includes chocolate brownie mix, vanilla frosting mix, sprinkles and instructions needed to make mini Sparkle Cakes. Sparkle Cakes are delectable frosted brownies topped with rainbow sugar sprinkles. Not only can this kids’ baking oven be used to prepare Sparkle Cakes, but there are many different types of Easy-Bake Ultimate Oven refill mixes (which are sold separately) that range from sweet to savory. Kids will have so much fun baking the included mini Sparkle Cakes for their friends, or whipping up some other yummy snack for the family. It will provide any girl or boy with hours of creative and engaging play. The Easy-Bake Ultimate Oven Star Edition and all related properties are trademarks of Hasbro.